Intel today introduced its new Movidius™ Myriad™ X vision processing unit (VPU), advancing Intel’s end-to-end portfolio of artificial intelligence (AI) solutions to deliver more autonomous capabilities across a wide range of product categories including drones, robotics, smart cameras and virtual reality. 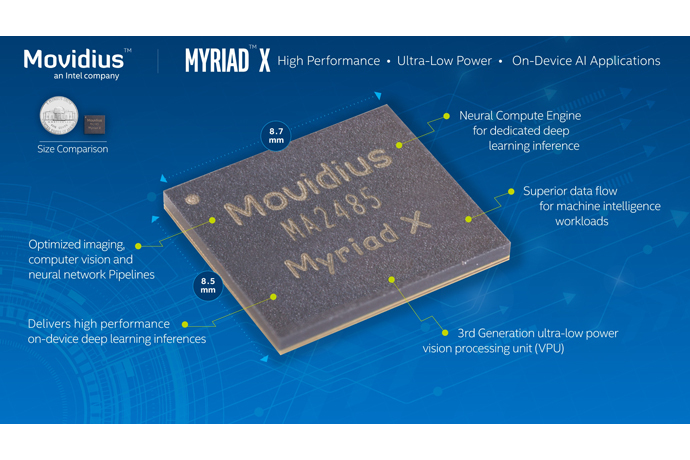 Myriad X is world’s first system-on-chip (SOC) shipping with a dedicated Neural Compute Engine for accelerating deep learning inferences at the edge. The Neural Compute Engine is an on-chip hardware block specifically designed to run deep neural networks at high speed and low power without compromising accuracy, enabling devices to see, understand and respond to their environments in real time. With the introduction of the Neural Compute Engine, the Myriad X architecture is capable of 1 TOPS1 of compute performance on deep neural network inferences.